Concentration is the key as Sam tries to control that crazy contraption. Chutes, pushers, slides, and swing arms are just a few of the gadgets you'll need to guide Sam's socks into the baskets. The Sock-O-Matic even has a Custom Level Builder that allows kids to create their own puzzling levels! Challenging, arcade-style games for children of all ages. Brand new action with all the quality you'd expect from Humongous Entertainment. Save your game after each level and track the progress of up to 75 players. 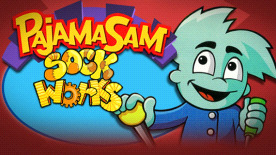 Pajama Sam's Sock Works ©2014 Tommo Inc. All rights reserved.